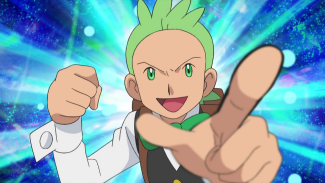 The episode we know as the 37th episode of Pocket Monsters Best Wishes, "The Fishing Sommelier Dent Enters!!" premiered on TV-Tokyo on June 23rd, 2011. 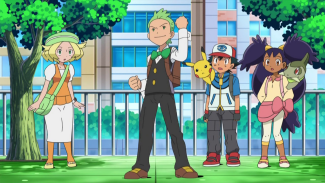 What ended up airing, however, was an edited version of an episode that was supposed to premiere several months earlier. This page explores what exactly happened with the episode and why the companies in charge felt it was necessary to edit it the way they did. So what happened? Why was this episode delayed? This episode was originally meant to air on April 7th, 2011 as the 26th episode of Best Wishes. At the time, the episode was known as "The Hiun City Fishing Tournament! The Fishing Sommelier Dent Enters!!" (ヒウンシティのつり大会！釣りソムリエ・デント登場！！). After the Great East Japan Earthquake took place on March 11th, however, the episode was skipped over and the next episode to be produced, "Beware of the Cute Face! Paralyzed by Emonga!! ", aired in its place. 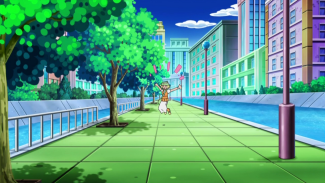 Though an official announcement has never been made regarding the reason for the episode's postponement, the most popular theory is that the episode's setting - a city surrounded by water - was deemed too unsettling for a country that was still suffering from the effects of a massive tsunami. Public awareness of this particular Best Wishes episode was pretty low at the time. While the skipped Rocket-Dan vs. Plasma-Dan two-parter was heavily advertised, both on TV and in print, this episode was comparatively unknown. Outside of a few TV listings and a brief one or two sentence summary, nothing else was known about this episode. No screencaps, no cast list, nothing. OLM and TV-Tokyo skipped the episode knowing that the overwhelming majority of the fandom had no idea it existed. With all this in mind, OLM took the two months between the episode's intended airdate and its actual airdate to re-edit the episode to make it fit into a later point in the series. Now, instead of being the 26th episode of Best Wishes, it is now the 37th episode and takes place between the Archen and Zorroa episodes. The original cut of the episode has never been made available publicly, but we can still make educated guesses on what's been changed for the version that did eventually air. Based on the episode's original title and summaries, we know that the unedited version took place in Hiun City. In this new version, however, the "Hiun City" part of the original title is removed. Additionally, the city's name isn't brought up in any of the dialogue at all, suggesting that some lines were re-recorded to remove any references to the Hiun City. 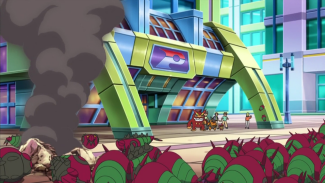 The Pokemon Center shown at the very beginning of the episode may have been edited, but it's hard to tell. 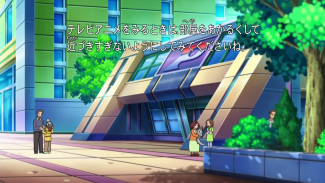 It certainly looks different from the Pokemon Center we see in the other Hiun City episodes, but that may very well be because the producers of the TV series wanted to give the city two unique looking Pokemon Centers. The street's still the same, though, so if this was an edit, it's a rather sloppy one. BW 022 "Hiun City! The Fushide Panic!" BW 037 "The Fishing Sommelier Dent Enters!!" 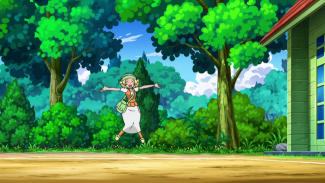 There's also the scene at the very end of the episode featuring Bel running off. We know this was added post-3/11 because if this episode had aired when it was originally scheduled, Bel would have stuck around for the two episodes that followed it. She certainly wouldn't have left at the end of this episode and then reappeared at the beginning of the next one for no reason. The animators didn't just reuse animation from previous episodes and then paste that onto a new background, either. If you check all of Bel's other appearances up to that point, you'll see that the animation used at the end of this episode is brand new. BW 013 "Chillarmy is a Neat Freak!?" BW 025 "Emonga vs. Tsutarja! The Volt Change Chaos!!" There may be other edits made to the episode as well, but we'll probably never know what those are. Despite all the efforts made to hide the fact that this episode aired out of order, there are quite a number of telltale signs that this aired out of place. For starters, Hiun City is shown as the gang's current location in the map everyone looks over at the beginning of the episode. 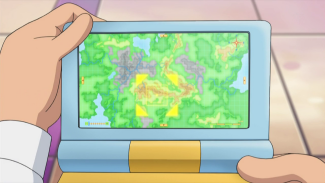 The scene from the TV episode is on the left while a shot of the in-game map from Pocket Monsters Black & White is on the right. 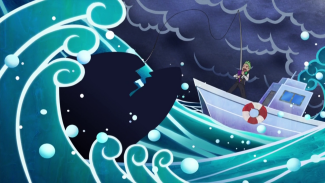 This was supposed to be the episode that introduced us to the idea that Dent is a Fishing Sommelier, but since this episode ended up airing after "Gamagaru and Maggyo! Battle at the Waterfront!," everyone's surprise here is a bit puzzling. They should already know he's a Fishing Sommelier by this point, right? 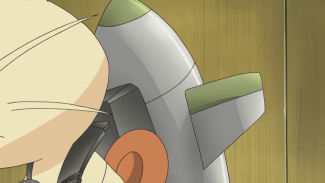 Satoshi looks up Kojirou's Deathmas in his Pokemon Zukan because, if this was BW 026, this would have been the first time he's ever seen the Rocket-Dan's new pokemon. 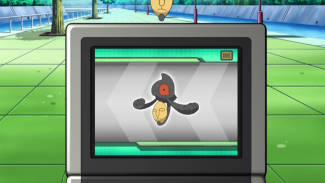 In the BW 037 version, however, it's weird that he would bother scanning a pokemon he's fought multiple times by now. We can also deduce that was supposed to be the first time we see the Rocket-Dan use their rockets to blast off since we have all the lingering close-ups of the things. It isn't anymore, however, so this extra attention being spent on these getaway devices we've seen plenty of times by now is a bit odd. This episode airing when it does also means we get all those "Dent's a ____ Sommelier!!" gags all at once instead of having them all spread out the way they were intended to be. If this episode had aired back in April, we wouldn't have had three Dent episodes airing back to back to back like this. This all looks like a lot of lazy oversights, but really, I don't think it's all that bad. The only reason this sticks out so much to us is because we knew, going into this episode, that the whole thing was airing out of order. In other words, we were looking for things like this to pick apart. Your average fan, however, probably wouldn't notice that anything's amiss. Why were these edits even necessary in the first place? A lot of fans hate that the episode was retconned in the first place. They seem to think that the best thing for OLM to do was to just air the episode as-is with a disclaimer telling kids that this is an episode airing out-of-order. The thing is...television networks never do this. Ever. Can any of you guys think of a single instance of a Japanese TV station airing an episode of a serialized children's program out of order, and then admitting it up front? How about any Western TV stations? You can't, because nobody does that. I mean, think about it. "Here's this week's episode of Pocket Monsters Best Wishes! This episode was supposed to air back in April, but we pulled it because a sizable chunk of our viewers died in that tsunami back in March. Remember that? Remember all that death, and sadness? Anyway, enjoy the show!!" Even if they weren't completely upfront about the reason they pulled the episode, the idea of even admitting that the episode was postponed in the first place is unappealing. What good would it do them, exactly? Let's think of it another way: it would be like if 4Kids put a disclaimer before one of their episodes informing kids that the episode they were about to watch had content that was edited out. They wouldn't draw attention to something like that because, really, they have no reason to do so. 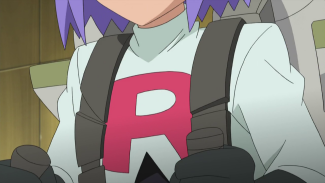 The closest we've had to what the fans want is what happened to the two Kanto episodes "Rougela's Christmas" and "Iwaku as a Bivouac." 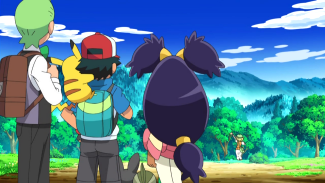 Those episodes were originally meant to air in late December 1997 / early January 1998, but they had to be postponed because of the "Pokemon Shock" incident. TV-Tokyo didn't want to just scrap these two episodes, so they waited about ten months before premiering them together as part of an hour long special. 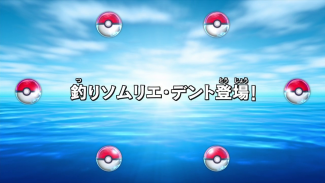 This special aired on a Monday evening (Pocket Monsters was airing on Thursday nights by that point) and labeled the two skipped episodes as bangaihen (番外編), or "special episodes." The reason they probably did this, though, was because they couldn't go in and edit an episode like they can today. The show was still being animated by traditional ink and paint, so editing out something like Satoshi's Hitokage would have been herculean task that would have required more time and money than it would have been worth. We're talking months and months of additional work here. I'm sure OLM and TV-Tokyo would have liked to make those older episodes fit into a later point in the series, but the limitations of the time prevented them from doing that. In 2011, however, everything's done digitally and said limitations no longer exist. Basically, OLM and TV-Tokyo thought it would be better to quietly re-insert this episode into the series without making a big fuss about it than it would to draw any special attention to it. And for the most part, it worked. While your average Pokemon fan on the Internet knows what's up, the type of person who visits Pokemon websites and message boards only makes up a tiny percentage of the overall fanbase. The overwhelming majority of Pokemon fans, believe it or not, don't suspect a thing. For them, this is just another episode. All in all, I'm not too bothered by the changes. I understand why the episode was postponed and can also see why they wanted to try to fit this in as best they can. And really, I'm just happy the episode even aired at all. We were told up front that the Rocket-Dan vs. Plasma-Dan episodes would eventually air, but we never heard anything about this one. To see it air, even in an edited form, is more than I honestly expected.